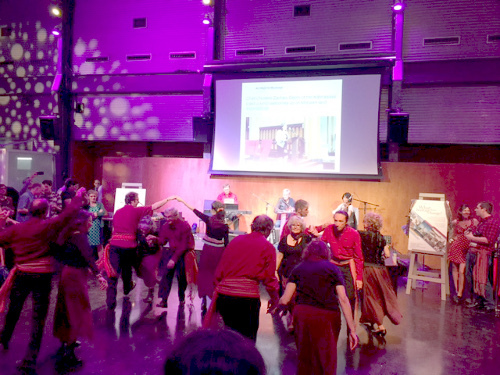 Traditional Québécois folk dancing at the end of conference celebration. In my earlier post, I summarized the first full day of the Association for Critical Heritage Studies (ACHS) 2016 conference. Now that I’ve returned home, I wanted to sum up the remainder of the conference and my overall impressions of the Association for Critical Heritage Studies (ACHS). I will not attempt to summarize every session I attended, much less the several hundred individual sessions that were at the conference. Instead, I will focus on the areas which I personally found to be most meaningful. One of the most frequent areas of study for critical heritage studies researchers, which was well represented at this conference, is the visitor experience at museums. For historic sites, maximizing this experience is far from an academic question — it’s a sustainability question. Without sustained visitation, the existence of the site becomes tenuous, at best. Last year, I was excited to see Smith and Campbell’s (2015) work on the affective qualities of heritage. While my work has focused on understanding the emotional attachment to heritage places through a phenomenological reduction, Smith and Campbell, along with others working in museum studies, are interested in the ability of visitors to empathize with others through their experience of the site. In a morning presentation, Laurajane Smith summarized her work, based on 4,500 interviews of visitors to museums over a period of 10 years. Rather than going to a museum to learn, people go to heritage sites to feel, a finding that ought to have important ramifications for historic site administrators who often emphasize objective, factual-based education in their interpretive materials. In the majority of cases that Smith examined, people chose heritage sites that reinforced their existing ideas/understanding and were not necessarily interested in learning something new. In these interviews, “deep empathy” was uncommon, but some kind of empathy was required to achieve more that a shallow engagement with the site. Whether or not a site was considered to be authentic was related to the quality of the “emotional authenticity” experienced by the visitors. In the realm of intangible heritage, the Burra Charter is often held up as a model of practice. Developed in Australia in the late 1970s, and unlike other conservation doctrines, it has continued to evolve over the decades; the current version was updated in 2013. I had long assumed that the Burra Charter must be ubiquitous in Australian heritage conservation practice, but I began questioning that assumption as I continually encountered Australian practitioners who scoffed at the idea. At the ACHS conference, Robyn Clinch presented an analysis of the use of the Burra Charter in “planning schemes” (policies and regulatory tools) in Australia, which shed some needed light on the situation. Clinch indicated that the Burra Charter is only referenced in 80 of 500+ planning schemes she analyzed in Australia. One conclusion is that in most of Australian practice, the use of the Burra Charter is, in fact, not required. But why is it not used more? Clinch observed that the Burra Charter is not a law, so its use in a regulatory framework or even a policy document, is entirely voluntary; it is, after all, only a guiding document issued by an NGO. What’s remarkable is that compared to most countries around the world, a charter issued by an ICOMOS chapter actually became law in some instances. Apparently, this happened largely through the political influence of the framers of the Burra Charter. Participatory or community-based research was well represented in many of the sessions. One of the more interesting examples was Sian Jones‘ presentation of an intriguing method for recording tangible heritage in partnership with members of a local community. Jones trained laypeople in the use of 3-D digital techniques to record and model heritage objects. The models created through this process helped the participants to legitimize their heritage, or as Jones indicated, they “stamped rights to their place” through the creation of these models. This work is a very interesting way to engage civil participants in recording their heritage and, in the process, engage in a place-making process. A common stereotype of professionals who work in built heritage conservation is that they fail to take into account the economic realities of building and place rehabilitation. The current reality, may, in some cases, be quite different, however. In a challenge to this assumption, Evangelia Alverti, a graduate student at the University College London, and her advisor, Kalliopi Fouseki presented a case study of the urban regeneration of the King’s Cross in London to explore the “gap between urban design and social design.” What they found was that heritage conservation professionals were, in fact, very much aligning their thinking with developers by privileging cash flow and economic feasibility while ignoring social change and gentrification issues. Conservation professionals thereby facilitated a “social cleansing process” by uncritically supporting the developers’ economic interests and by focusing too much on fabric and too little on the effects of environmental change on people. [The conference] takes “borders” as a broadly defined, yet key, concept for better understanding of how heritage is valued, preserved, politicised, mobilised, financed, planned and destroyed. Thinking through borders raises questions about theories of heritage, its methodologies of research, and where its boundaries lie with tourism, urban development, post-disaster recovery, collective identities, climate change, memory or violent conflict. Held in the city of Hangzhou, China, Heritage Across Borders will be the largest ever international conference in Asia dedicated to the topic of heritage. It has been conceived to connect international participants with local issues, and is so doing open up debates about the rural-urban, east-west, tangible-intangible and other familiar divides. I was able to meet some of the organizers for conference in Hangzhou and was impressed with their enthusiasm as well as the relationship of critical heritage studies to Chinese cultural heritage. I look forward to being able to attend in 2018. Basic statistics on membership were also presented at the ACHS general meeting. There are 1,520 members of which “heritage management policy” appears to be the most common self-described area of interest. A third of the members are interested in built heritage, which was much higher than I had expected, especially considering that this area of research is not particularly well represented in critical heritage studies literature, especially compared to museum studies. (It is worth noting that an “interest” does not equate to research expertise or publications in the area.) Based on these data, my hope is that we may see an increased focus on the intersection of law and built heritage/cultural landscapes with critical heritage studies literature. I took the opportunity at the general meeting to suggest possible changes to the ACHS manifesto, explaining that some practitioners feel personally attacked by its language and thus are unlikely to participate in a constructive dialog. I explained that built heritage conservation practitioners need a “space to think” that the ACHS could provide. Heritage practitioners, especially those individuals who conduct compliance-based work in built heritage, cannot openly critique, much less criticize their practice, even if such efforts are clearly in the public interest. I’ve heard too many comments from these US-based practitioners that they are told by their employers (cities, states, federal government, CRM firms) that they are “not paid to think”; indeed, engaging in such thinking can be a job-ending act. Critical heritage studies is clearly focused on changing practice, but in order to do so, practitioners must be engaged as equals and treated with respect. Achieving these objectives does not mean rejecting the reality of heritage conservation practice that is defined by expert rule and marginalization of meanings outside of official discourses. What this change does mean, however, is the ability to turn practitioners into advocates for change. Academics are particularly good at creating islands of knowledge; I sincerely hope that the ACHS does not become yet another island, sequestered from the real world and hence unable to affect or influence practice. I was rather surprised that my engagement of the ACHS manifesto did not engender more discussion from its members, however. Rather than assuming that this silence equated to the members accepting the manifesto uncritically, my impression was that few members have actually read the ACHS manifesto and are aware of its content. To be honest, the reaction was much like I receive with my students when they have not done their assigned readings. But perhaps my question spurred a few more people to read the manifesto and, like me, offer a critique of it to better address how the ACHS can influence heritage conservation practice. Many countries now have an ACHS chapter, including the United States. I attended the US chapter meeting and hope to participate in its work in the future. The members are quite diverse, with a particularly strong emphasis on folklore. We agreed that one way to recruit people to join the chapter is to summarize the following main points of the ACHS manifesto: 1) to not be afraid of conducting research that will make us uncomfortable; 2) to not be afraid of challenging authority; 3) “democratize heritage”; and 4) critically analyze how expert-driven discourse disempowers communities. Overall, I was very pleased with the ACHS conference and the people I met. I was especially encouraged to find many like-minded researchers and practitioners with an interest in applied social science research in the conservation of built heritage and cultural landscapes as well as ways of bridging the theory/practice divide in heritage conservation. I look forward to the ACHS conference in China in 2018.